A magnetic sensor and system has been developed for measuring the thickness of austenitic stainless steel cladding and other nominally nonferromagnetic materials applied to steel pressure vessels. The primary application involves nondestructive evaluation of nuclear reactor and petrochemical pressure vessels clad with stainless steel. Evaluation of the acceptability of detected flaws according to ASME section XI requires that the depth of the flaw into the base metal be determined. Ultrasonic testing (UT) can determine the total flaw depth from the examination surface, but the depth into the base metal cannot be measured precisely unless the cladding thickness is known. The magnetic clad sensor is used for this purpose. In another similar application, the sensor can be used to measure the thickness of Inconel attachment weld areas on the inner wall of boiling water reactor (BWR) pressure vessels. The clad thickness measurement system is based on a magnetic technique that responds to the distance between the probe surface (which is placed on the clad surface or attachment weld surface) and the ferromagnetic steel base metal; this distance is equivalent to the clad or weld thickness. Because welded stainless steel clad contains some ferrite, it is also slightly ferromagnetic, and therefore its presence must be accounted for by calibrating on a block with welded stainless clad of different thicknesses. Inconel welds are nonferromagnetic; therefore, a calibration can be performed using nonmagnetic material. This presentation describes the probe and other components of the system, results on test specimens, and initial field tests on a commercial nuclear reactor. Conventional commercial light water nuclear reactor pressure vessels (RPVs) are fabricated of carbon steel sections, with protective layers of stainless steel cladding applied to the vessel interior. Periodic inspections of the vessel welds are required, as specified in Section XI of the ASME Boiler and Pressure Vessel Code, as well as other codes adopted by the various regulatory agencies. According to Section XI, vessel integrity is determined by the depth of cracks in the base metal only; e.g., for a crack that penetrates the base metal and the cladding, only the portion of the crack that penetrates into the base metal is significant for determining vessel suitability for use. Conventional ultrasonic testing (UT) has been highly developed and is quite capable of determining the depth of near surface flaws in cladded vessels; however, such UT typically cannot distinguish between the cladding and base metal – the impedance mismatch between the base metal and cladding is insufficient to obtain a clear indication of this interface. Therefore, although the conventional UT inspection can be used to determine the depth of near surface flaws, it cannot be used to determine the portion of the flaw depth that exists only in the base metal. In such cases, some independent means of knowing or determining the thickness of the cladding in the vicinity of the flaw can be used to determine the extent of the flaw in the base metal. Our approach, as described in the below, was to use a magnetic technique to determine the depth of the cladding. The magnetic technique takes advantage of the fact that the cladding is nominally austenitic, whereas the base metal is ferromagnetic. The basic problem and solution by the magnetic sensor method is illustrated in Figure 1. This magnetic technique can be used to measure the thickness of cladding as well as that of Inconel attachment welds commonly used in BWRs. Fig 1: Crack Depth Measurement Problem Showing Portion of Crack Depth Measured by UT and Clad Thickness Measured by Magnetic Sensor. The approach chosen was to develop a magnetic sensor method to measure the spacing between the clad surface and the base metal. The probe consists of a U-shaped permanent magnet and a Hall-effect sensor placed between the poles, as shown in Figure 2. As the probe is placed closer to ferromagnetic material, more of the magnetic flux lines spanning the poles of the magnet will enter the ferromagnetic material, and thus the magnetic flux density at the Hall-effect sensor will be reduced [1,2]. An analog-output Gaussmeter was used to measure the output of the Hall-effect sensor. Fig 2: Clad Thickness Probe Principle. One implementation of this probe, on a calibration block, is shown in Figure 3. Fig 3: Magnetic Probe on Step Calibration Block. The probe was first tested on this calibration block. A schematic diagram of the block, showing the clad thickness steps, is shown in Figures 4. The calibration block is ASTM A533 Grade B carbon steel with 308/309 stainless overlay, which is representative of U.S.-manufactured vessels. Figure 5 shows the results of the tests; from this figure it can be determined that the useful working range of the probe extends from as low as 5 mm (the smallest clad thickness) to approximately 15 mm. At larger thicknesses, the response increases only slowly. The smooth curve of Figure 5 was determined by fitting a 3rd order polynomial to the measured data. Fig 4: Clad Thickness Block Calibration Block drawing. All dimensions are in mm. Fig 5: Response from Calibration Test Block. In order to determine the general applicability of the technique, several blocks fabricated using similar techniques, but at different times, were also tested. The results are shown in Figure 6. Fig 6: Response to Multiple Test Blocks. The results of the tests indicated that for similar materials, the error caused by clad variations would be relatively small. A probe was fabricated and clad thickness measurements were made during an in-service inspection of a commercial nuclear RPV. The probe was packaged in a housing compatible with existing UT probe modules, and made suitable for use underwater. Instrumentation was placed on the operating deck, out of the water. The existing SwRI EDAS-ET data acquisition and analysis system  was used to acquire and analyze data taken during raster scans of portions of the reactor vessel. A schematic diagram of the configuration is shown in Figure 7. Figures 8 and 9 show representative data taken from the RPV. In Figure 8, the clad thickness predicted by the probe ranged from a minimum of 5.3 mm to a maximum of 15 mm in the region to the right of the figure. 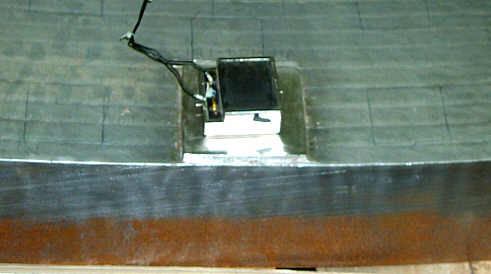 For this particular area of the vessel, the clad in the region to the right of the weld in the figure was applied manually and was believed to be thicker that normal. Fig 7: Mechanized ISI Configuration. 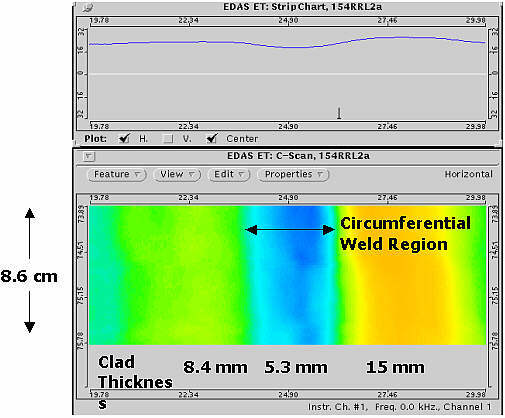 Fig 8: Clad thickness data from circumferential weld of RPV. The strip chart at the top shows the amplitude of the clad probe signal for one scan line. The image at the bottom shows the amplitude in a color scale for the scan region indicated. Fig 9: Clad thickness from another region of a circumferential weld. The clad thickness system previously developed was tested on a block provided by EPRI, test block 104-1D1, shown in Figure 10. This block is clad with stainless steel except in a 4.5 x 4.5 in attachment weld region that is covered with Inconel (Alloy 182). Tests were performed in both the stainless clad and the attachment weld regions. Measurements were made in the stainless clad region at 11 different locations. The probe was calibrated using an existing block with 308/309 clad material; the clad thicknesses in this block are based on the distance from the clad surface to the base-metal fusion line. Based on this calibration, the measured clad thicknesses in the stainless steel region ranged from 0.22 to 0.25 inch. For measurements in the attachment weld region, a calibration curve was made by using aluminium spacers between the probe and the base metal of the calibration block in a region without stainless cladding. This method was used because the Inconel cladding in the attachment region should be non-magnetic, except for perhaps a small region at the base-metal interface that may have ferrite in the weld zone. Measurements were made at the 4 corners of the Inconel pad, and in the center of the pad. 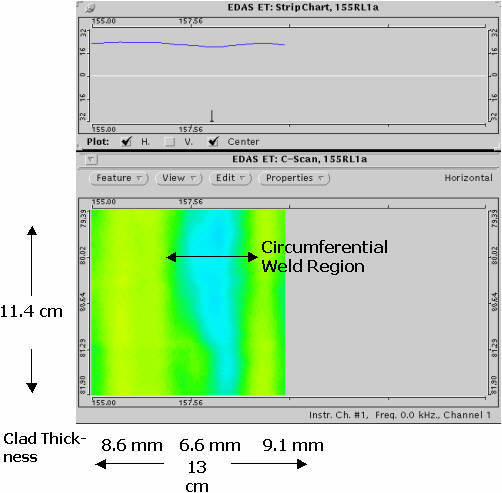 Fig 10: EPRI test block 104-1D1 used for attachment weld tests. Thickness readings in the attachment weld ranged from 0.70 to 0.84 inch. The Inconel pad extends above the stainless clad approximately 0.22 inch; therefore the total thickness of the pad would appear to be the clad thickness plus the distance above the clad, or approximately 0.25 + 0.22 inch. Our understanding of the process for manufacturing the pad is that the stainless clad is applied first, then it is ground away with some additional base metal being removed to ensure that ther is no remaining stainless steel. The Inconel is then welded to the base metal. This process would result in the base metal surface being below the original surface, and a pad that is thicker than it appears. Thus the clad measurement system readings appear to be very reasonable. A magnetic sensor for measurement of nominally nonmagnetic stainless steel or Inconel welded on carbon base metal was successfully developed. Systems with this measurement approach have been successfully used in mechanized ISI and manual exams; there is strong evidence that the same approach can be applied to BWR vessel attachment welds. Bray, D.E. and Stanley, R.K., 1989, Nondestructive Evaluation, A Tool for Design, Manufacturing, and Service, McGraw-Hill Book Co., New York, pp. 177 and 230-236. Chikazumi, S. and Charap, S.H., 1984, Physics of Magnetism, Robert E. Krieger Publishling Co., Inc., Malabar, FL, pp 24-29. Fisher, J.L., Polk, K.D., and Hamlin, D.R., 1992, "An Eddy Current Based Inspection Capability for ISI of Aging Pressure Vessels," Nuclear and Pressure Vessel Industries, ASM International, Materials Park, OH, pp. 435-439.